AGC’s philosophy is to design, build and deliver projects that exceed the customer’s expectations on every level. By using a total team approach, AGC coordinates the efforts of all aspects of the project to ensure a smooth path to a successful completion. Each team is comprised of the customer, architect, engineers, and project managers, as well as the on-site supervisors and workers. Always placing the customer first, the other members strive to work in concert to fulfill the common vision and goal. AGC takes its responsibility to manage each project seriously, never compromising the quality of any phase of the project. From inception to completion, our goal is to deliver an on-time, in-budget product that exceeds the customer’s expectations. 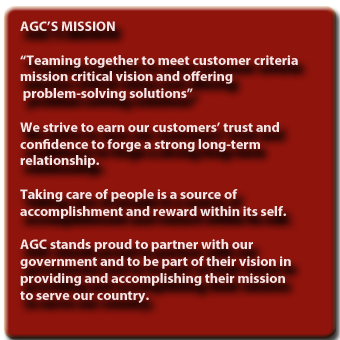 AGC’s Safety Program is one of the company’s highest priorities. Employees hold numerous safety certifications and are required to keep them current at all times. Initial training and certifications are provided for new employees, with continued education and re-certifications offered throughout the year.